The “macro lace” Malabrigo cardigan is just off the needles – the picture of efficiency today, I took some photos right away, uploaded them, and here they are! These are just some kinda rough photos so you can see the shape. I’ll be taking proper photos to go with the pattern soon. The finished pattern probably won’t be available for a couple of weeks though! Oops, it’s upside down in the photo. But this cardi-shrug thing is reversible from bottom to top, so you can wear it either way! It is dolman-sleeved, which is pretty polarizing, but I happen to be quite pleased with the shape for this particular piece. Plus, it’s super easy. It’s not really a cardigan in my book because it doesn’t close in the front (although you could make the ribbing longer so it would close). The Malabrigo makes this super comfortable, it’s sort of like wearing a blanket around your shoulders but way more stylish! The pattern is forthcoming and will be out in July. It will probably have fewer sizes than my usual because the fit is pretty generous and would look great on a variety of body types. Don’t worry though, it’ll still have at least 5 sizes! And the sleeves will be totally adjustable to fit whatever your arm size is. I’m a 35-36″ bust and this took 4 skeins of Malabrigo. It’s not quite seasonal considering that the weather just decided to start warming up dramatically here, but would be a great summer knit in a cotton or blend! Beautiful design. Love the yarn color and especially the fact that it’s Malabrigo! 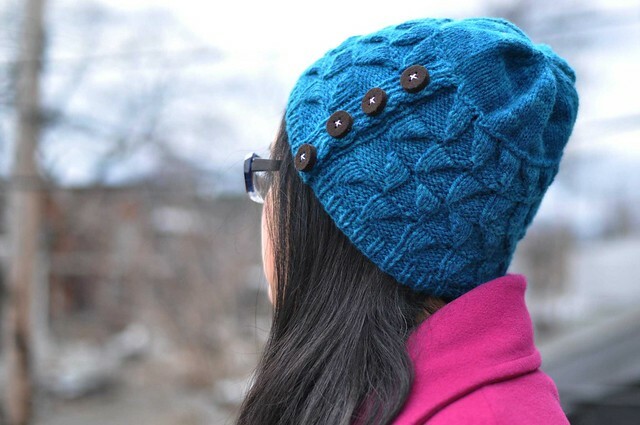 I look forward to the release of this pattern. That looks like it could be the first garment I’ll try knitting… Looking forward to the pattern! 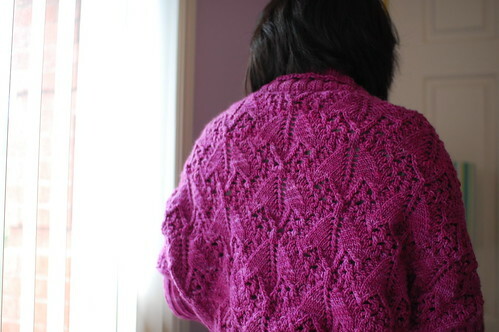 I love the lace pattern and it looks great in the gorgeous deep magenta – yum! Can’t wait to try this out! Yeah! Anything that takes less than 6 skeins is an A+ knit in my book (so expensive those multi-skein projects get). It’s lovely; I can imagine how wonderful it feels, too, in gorgeous Mmmmmal! Oooh! Really pretty. Did I just read that you could make this into a longer cardigan, as well? I’ll go back and re-read. Very nice! Just lovely! I really like how you used lace in a modern shape like a shrug. So pretty! I can’t wait to cast on! I love the dolman sleeves, I really think that that’s a flattering shape on almost everyone! Are you looking for test knitters? Beautiful! What a talent you have for designing such great patterns & choosing gorgeous yarns to make them with. How absolutely smashing that color is on you. 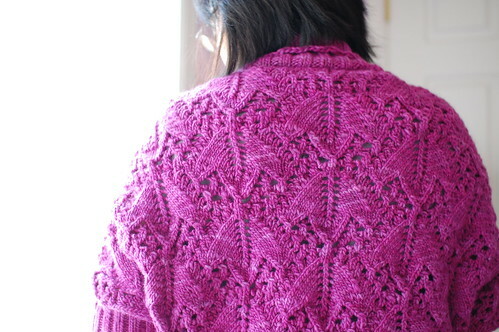 Wow, your blog proves the delights of being an adventurous designer/knitter. Thanks!